We often think of Branch Line trains as short trains. In the steam era with light 42 lbs rails the load could be under 200 tons, thus not a very long train. Another factor to consider is the number of stations on the line or how long the branch line is. Some branch lines were short with just a few stations or siding, other were much longer. Brisbane Valley Branch – Ipswich to Yarraman 163.250 Kilometres, seven (7) crossing stations and some 22 sidings. Many station yards had more than just one siding. Dalby – Glenmorgan 165.43 kilometres. 4 crossing stations and 29 sidings. 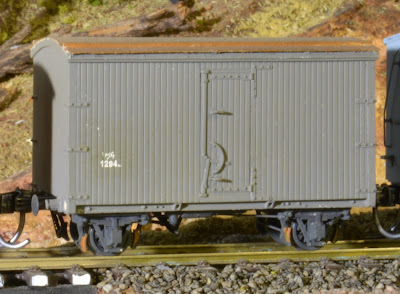 Ten (10) of these siding would come part of the Dalby shunt engine work. Gympie – Kingaroy Branch 130.810 kilometres, six crossing stations, plus the Proston Branch. Monto Branch, 267.849 kilometres from Mungar, some 12 crossing stations with one being just 44 units long. Following the introduction of 60 Ton Diesel Electric Locomotives this all changed, the 1720 class locomotive being the top dog with 1000 hp. 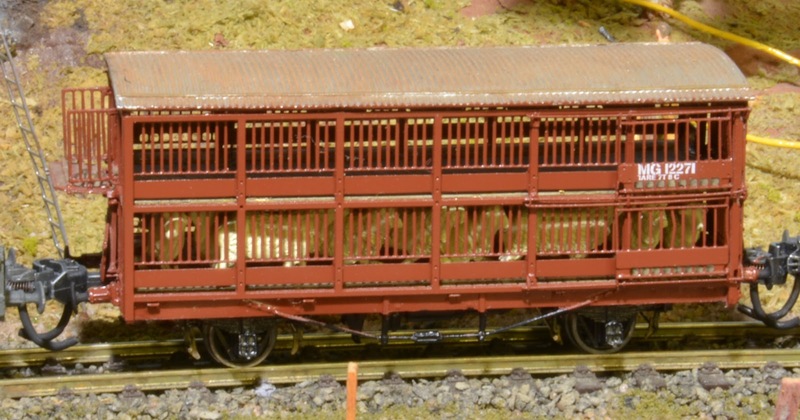 Beaudesert cattle trains went from 12 wagons to 32 wagons with a single engine. Understatedly less trains were required, trains became longer. Of late I have been changing over couplings on my older wagons. 711 Kadee are being replaced with 158 whisker coupling. At the time the 711 (H0n3) coupling was a good idea. Queensland Railways had four drawgear classifications. 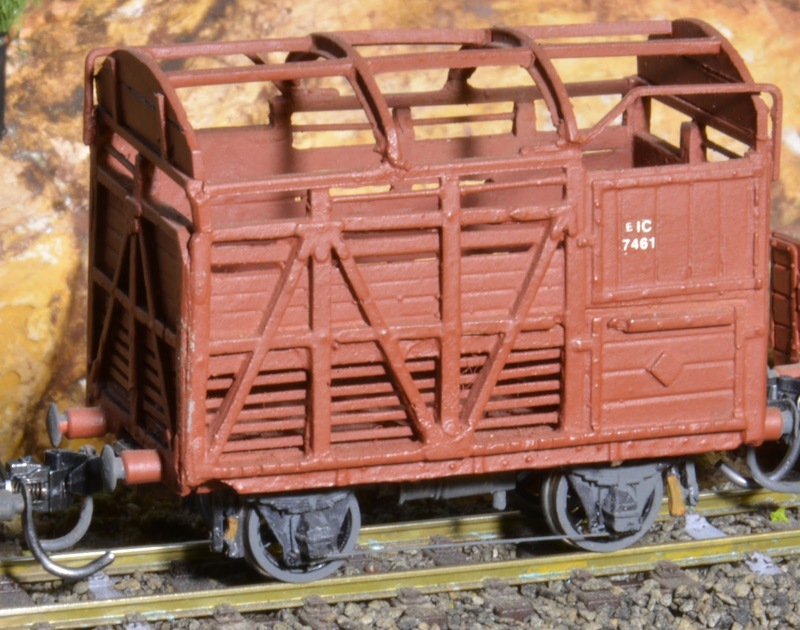 Auto (D1), Premium (D2) hooks on the steel rollingstock built in the 60’s, Select (D3) hooks on steel wagons built in the 50’s and newer wooden wagons and ordinary (D4) hooks on the older wagons and four wheeled wagons. Mounting the standard # 5 Kadee was an issue with 12mm gauged rollingstock, often the coupler box would foul the wheels, back to back was just over 10mm. 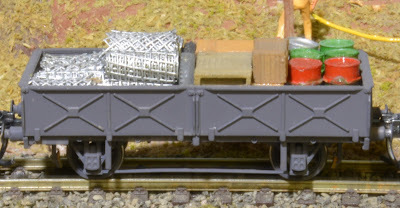 My newer steel wagons had # 5 fitted without the box. 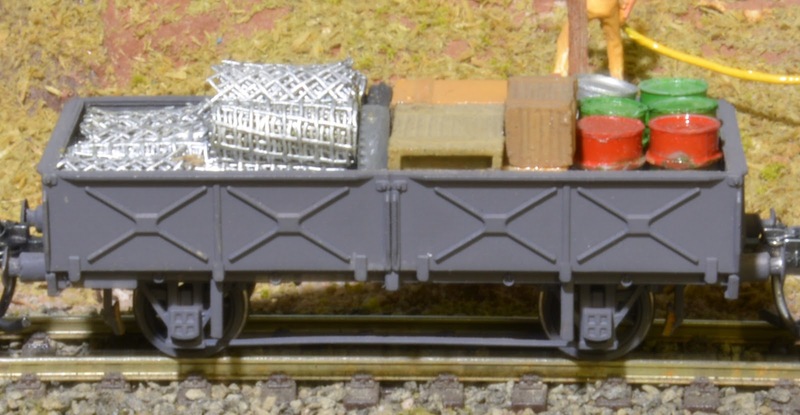 QR auto coupling are much the same size as the standard gauge wagons on the NSWR. 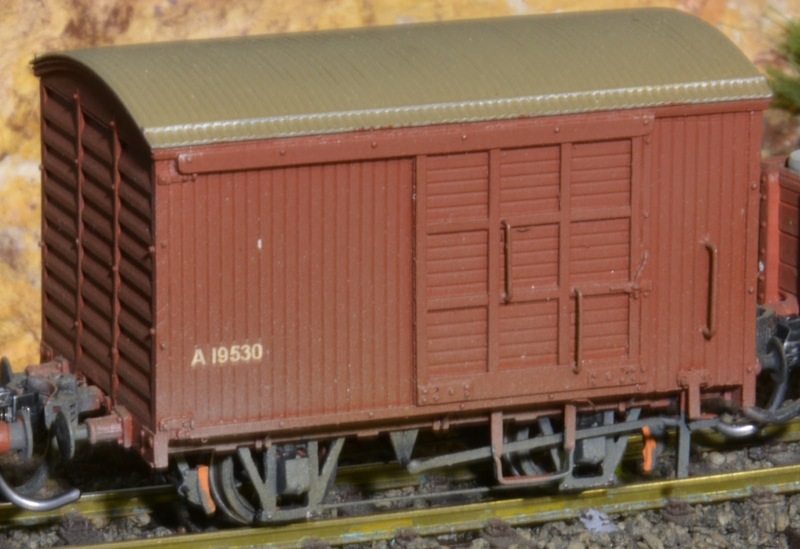 The method in my madness was the older wagons with D 4 drawgear were fitted with 711 couplings, all other wagons had standard # 5 couplings. This was OK for trains running around in circles, but once I started operations with shunting moves in and out of various siding, the 711 would often come apart. 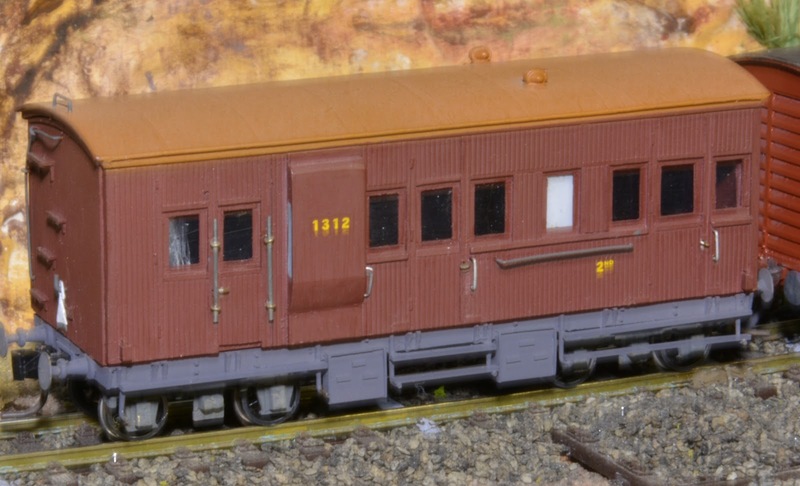 Mixing coupler types in model railway is not the greatest move. I feel the Kadee # 158 scale head whisker coupling is the greatest thing since sliced bread, more on that at a later date, back to the branch goods on the layout. After the coupling changeover on my older rollingstock I put them together to form a train to test out the new couplings which I called the Branch Goods. Trains heading west carry different loads to trains running east towards the coast. If you cross two trains at a station, the loading of both trains should be very different. As they say, what goes “UP” comes back “DOWN”. Trains heading west away from the coast (Brisbane, Rockhampton, Townsville, Cairns) are “UP” trains, trains coming back towards to the coast are “DOWN” trains. The same applies to trains on branch lines, as they continue on off the main trunk line. What is carried on the trains reflect what is on the line, what activities / industries on the line. Trains heading away from the coast to the west were the life blood for these towns. Going back to the 1960’s, the train was the best way into and out of most western towns, many roads were still dirt and rough with a trip often ending in break downs, stones through the windscreen or hitting a kangaroos causing damage etc. The train supplied the essentials for life, food, fuel, timber, new cars, trucks, tractor, machinery, the goods required to keep towns/industries going. 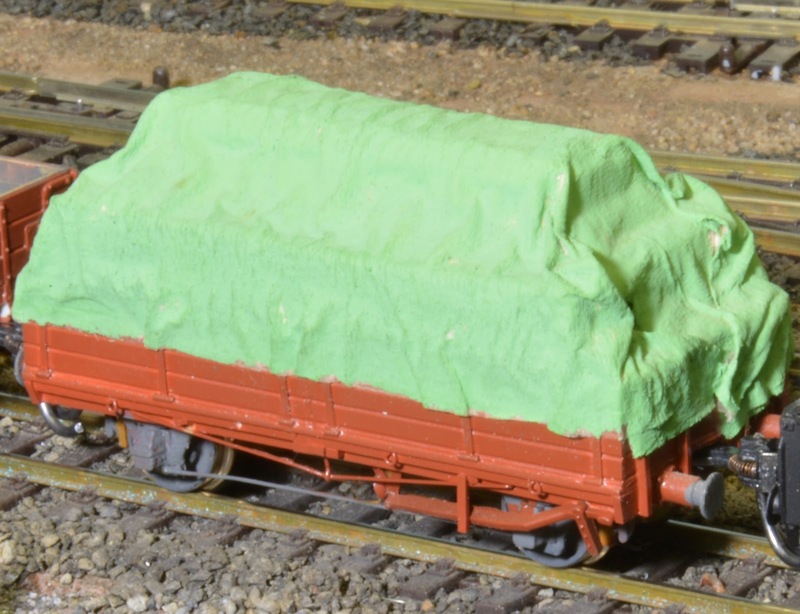 Plus there could be special purpose wagons empty for return loading, i.e., cattle, grain wagons etc. Trains coming back carried goods produced along the line, wool, grain, sheep, cattle, logs etc., some wagons came back empty. Even in today environment it is possible to identify where trains are going or coming from. The same wagons going out come back with different loading. Don’t look to hard at my previous video ??? Hauling Loco. 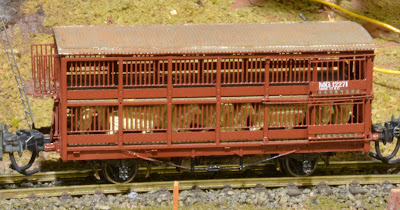 Wuskie Models 1720 DEL, weathered, friendly driver added to cab (fireman asleep on the floor), lead added to fuel tank, frame and body lifting the weight to 210 gram. FGW water wagon. 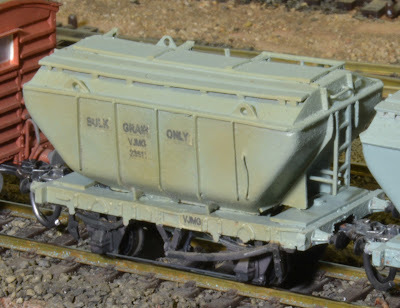 Chivers fine scale underframe, scratch built body. Working Time Table allocated set days for trains to supply water to gangs and isolated homes. A white flag/disc was placed on the trackside tank if water was required. The fireman and guard did the watering duties. A timber plank located in the wagon frame was used as a bridge for the canvas hose. From time to time the hose would slip off the plank often ending in one getting very wet. If you were smart you would hop up on the wagon and operate the value to control the water supply. 26’ S wagon. 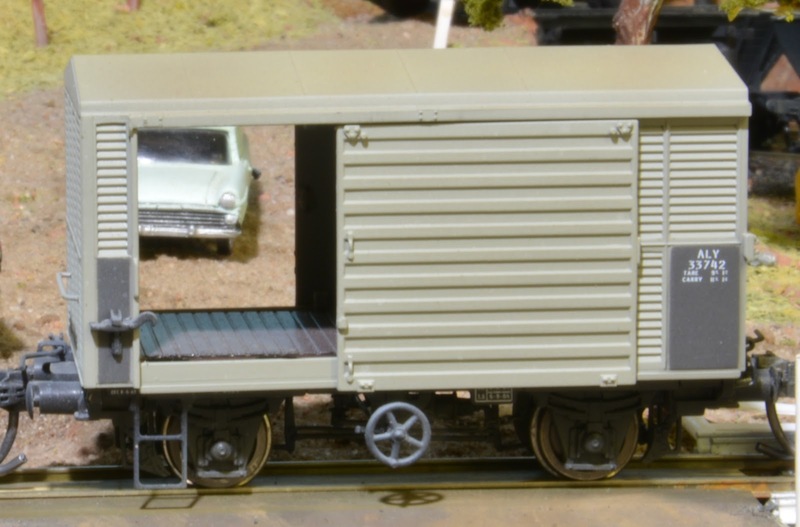 Scratch built Caintode Flats bogies. Timber load, balsa sheet cut into strips. HJS wagon. Scratch built FHN Brass bogies. Tichy Train Group Drums. ALY wagon. Southern Rail RTR Model. FJS wagon. Chiver's Fine Scale Kit. Cranky Freight Load. FJS wagon. Bass wood cut into sleeper size. FJS wagon. Chiver's Fine Scale Kits. Bass wood for timber. Cotton buds for pipe load. DF & F wagons. Wuiske Models Kit. Timber load. FGM & & FJS wagons. Chiver's Fine Scale Kits. Tractor Loads, Viking & Kerroby models. EIC elephant wagon. Scratch built. Peco TT "W" irons. VJMG wagon. Peco TT Underframes, Scratch build bodies. Body vacuum form styrene. Master built by the late Jim Fainges . Built around 1975, part of update progrqm. FG & AG wagons. Chiver's Fine Scale Kit. Plant Operator Camp. AG has working Grover's bogies. Full details of the train below along with some 1720 load information. 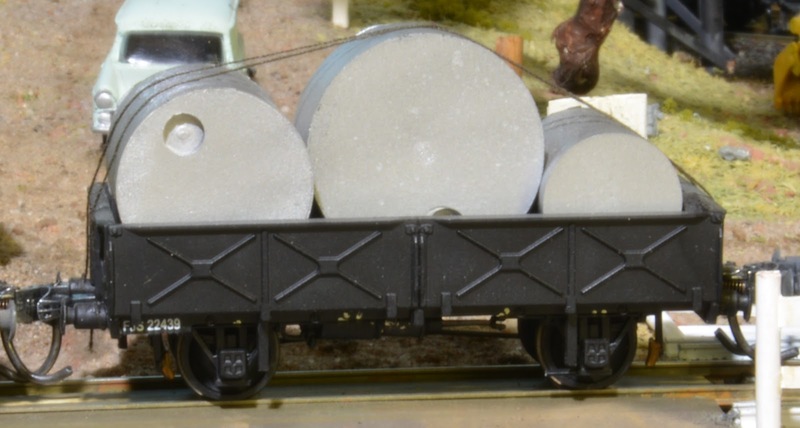 The weight of each wagon is shown on the RH side. QR Train Lists are made up from the van. Scratch Built. Peco TT W irons. Branch Line loads for 1720 DEL. UP Direction with Ordinary (D4) Drawgear. Train Spotting Saturday afternoon at Wyandra.